Colonel Haley - the US Army officer placed in charge of the DEO - begins to throw her weight around as Kara's efforts to profile a noted alien healer make him the target of anti-alien bigots. Meanwhile, Agent Jensen is transformed into a new Parasite, as part of Agent Liberty's efforts to create a soldier who can turn aliens' powers against them, while James struggles with Guardian's newfound popularity among anti-alien bigots. It's somewhat aggravating and oddly sexist that Elizabeth Hawkins' mother is never given an actual name in the episode, despite largely being the villain. She's also never given any real motivation for turning on Amadei Derros beyond his apparently impregnating her and cutting off contact, but we only have her word for this and she is... not exactly reliable. At least until he confirms breaking her heart, but no reason is given for why he did this. It isn't really explained just how Amadei Derros' amulet will let Parasite keep the powers he drains. Why did Elizabeth Hawkins' mother save all the letters that Amadei Derros sent her if her entire goal was to make her daughter believe she'd been abandoned and to hate her father? Why are The Children of Liberty suddenly being treated like a secretive dark-web group when Agent Liberty was holding a public rally, in costume, two episodes ago? If Col. Haley is trying to avoid starting a riot, sending DEO soldiers in black uniforms carrying large guns into a crowd of nervous aliens is a curious way of trying to do it. How did Guardian get inside the dome area? As a civilian police agent, Alex is not required to salute a military officer even if they do have authority over her. The lesson about Col. Haley not being as unreasonable as Alex thought is completely undercut by the end of the episode, where it is revealed that Col. Haley is the military-minded hardass Alex was afraid she would be and an unrepentant alien-hating bigot who seems to want all aliens put into concentration camps, based on her comments about the DEO needing to capture aliens instead of employing them. Why did nobody think, in regards to Supergirl confronting The Parasite, to use the sealed armored suit she was wearing last week? It's a small thing, but there's something so awesome about David Harewood slipping on his fedora as he ponders that he's become a true detective hero. The first Parasite in DC Comics history was a man named Raymond Maxwell Jensen, who first appeared in Action Comics #340 (August 1966) A low-life who lacked the intelligence to be a competent criminal, Jensen got a job as a plant worker in a scientific research facility with the intent of casing the firm so he could rob it. Mistakenly believing that the company's payroll was concealed in one of the metal containers used for storing hazardous materials, Jensen was exposed to strange energies that mutated him into the energy absorbing Parasite, allowing Jensen to gain the mental and physical characteristics of any being he touched. Agent Jensen is transformed into a new version of The Parasite in this episode, possessing the same energy absorption powers as Dr. Rudy Jones in 206. Ben Lockwood has a video blog on a right-wing fringe channel called The People's Veritas. This is quite likely a nod to Project Veri tas - a real-world right-wing group known for their efforts to frame liberal groups and politicians for crimes with faked hidden camera exposes, much like Ben Lockwood's efforts to fake an alien attack in the last episode. Uranium is less stable atomically than plutonium and runs the risk of creating a larger explosion. An electric force-field can contain the radiation of a uranium explosion. An improvised spherical ionic containment field would create the optimal distribution of electrons. Force-field discs can be linked to make a force-field matrix. Brainy is capable of outfitting a gun that can blast protons. Brainiac calculates that the output of the proton pack must be increased at least 550% to fight Parasite when he has the amulet. Kara: You two know each other? Brainy: But of course I did! Your address is 775 Gladiola Drive, second floor corner apartment. Your phone number is 555-8010. You stop at Bob's Diner every morning and order an extra super large coffee, milk. No sugar. Alex: Okay. Yes. That - he's not nearly as stalkery as that came out as. Nia: (laughing nervously) Well, why didn't you call me? Brainy: (confiused) You told me to find you. Not call you. Kara: Most people only have one way to fight for justice, but luckily, I have two. James: So I heard. And just to be clear, you and I do not represent the same things. Ben: Hmm. Far be it for James Olsen to listen to an opinion that is not his own. James: I listen to opinions that are not my own. But what I heard in your show was full of discrimination and hate. And that's when I stopped listening. James: And you forgot the part where people like me walk away. Ben: Do not shut these people out, James. Can't you see? The people who think this way, they're not crazy - they're scared. And they need those fears acknowledged. And when they are not? When they get shut down, like you're doing right now? It just... drives them deeper into darkness. James: (firmly) Let me be very clear about something, Professor. You will not lay this at my feet. Col. Haley: Still, I have to say it is much better to have you in charge than that impostor, J'onn J'onzz. Col Haley: When we at The White House learned about your former director's true identity, I recommended his removal. He was trying to erode the DEO's mission - employing aliens instead of catching them. All while pretending to be someone he's not. I am glad that order has been restored and we're heading to more civil, honest times. Alex: (evenly) J'onn J'onzz is the one who recruited me. Trained me. Promoted me. And taught me everything that I know. He's my family. And he's the best director that this organization has ever seen! Kara repaired the roof-garden at her apartment complex in one day. Brainiac 5 had no idea that mojitos were alcoholic and drank 12 of them. Kara gets an interview with Amadei Derros - a famous alien healer who has not given an interview in 20 years. J'onn is a friend of Amaedi Derros. Brainiac 5 claims to have a superhuman capacity for recovering from excessive alcohol consumption. A two minute nap is all he needs to regain his sobriety. Brainiac 5 was able to find out Nia's address, phone number and morning routine. He did not call her, however, because she asked him to find her - not to call her. The alien worm that transforms Agent Jensen seems to be exactly the same as the one that changed Dr. Rudy Jones in 206. Infernians are an alien species capable of generating fire and surviving intense heat. Scorcher, the alien assassin who tried to kill President Marsdin in 203, was an Infernian, as is the first alien whom Jensen drains as the new Parasite. Amadei Derros is part of an unidentified alien species. He has the power to heal others with a touch. It is unclear if this is a natural ability of his species or a power unique to him. His abilities do not work on humans because he cannot access their "frequency" as of yet. His life force is tied to an amulet. Jensen attacks a street performer - an alien shapeshifter who amuses crowds by changing into the people in the crowd. He kills the alien and uses his powers to escape after touching Supergirl. J'onn continues running Fiona's support group. J'onn reads Amadei Derros' mind and gets an image of a woman identified as Elizabeth Hawkins. J'onn and Kara later determine that Elizabeth Hawkins is Amadei Derros' illegitimate daughter. She claims to have never met him in person and to have never communicated with him, despite sending him pictures and reaching out to him several times. Elizabeth Hawkins' mother is revealed to have been lying to her daughter about her father. He apparently did try writing her several times, but the letters were all intercepted. Elizabeth Hawkins' mother is revealed to be the one who stole Amadei's amulet and gave it to a Child of Liberty, who in turn gave it to Jensen. Somehow, it enables him to keep the powers he steals. Kara, J'onn and the DEO learn about the existence of The Children of Liberty. Col. Haley orders Alex to shoot Jensen despite the fact that it will kill hundreds of civilians. Amadei Derros is healed and meets his daughter face-to-face for the first time. Jensen is eventually talked into removing the amulet, which kills him, when it is pointed out he is endangering humans. Before he dies, he says it doesn't matter becuase "he's still out there." in reference to Agent Liberty. Col. Haley is revealed to be an anti-alien bigot who slams J'onn's performance as DEO director. She becomes quite cold and starts demanding to be saluted according to military protocol after Alex stands up for J'onn. Jensen's brain-scan flatlined after The Parasite was removed from him. He was still alive and transferred to the DEO's desert facility. A woman named Mara Nalbeck looks for J'onn at the alien bar. Apparently her store was vandalized and she trusts J'onn to solve the case more than the NCPD. James plans to use his reputation as Guardian to help him get to the people running the anti-alien hate-groups and hopefully talk the people who are scared rather than hateful into changing their hearts and minds. He starts off by calling Ben Lockwood and asking him to talk. Samantha Hawkins' mother doesn't even merit a name of her own. 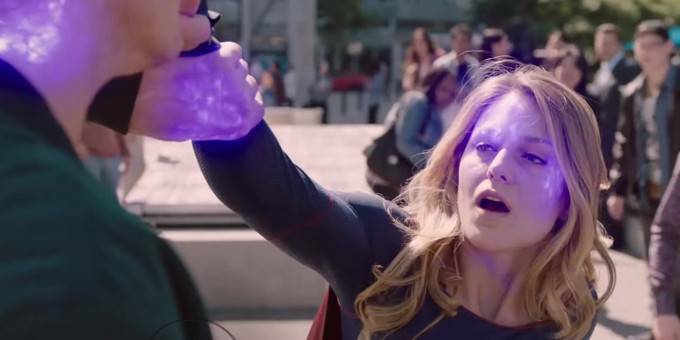 Quite possibly the dumbest episode of Supergirl since the last story with The Parasite. The villain is completely wasted and gone after a single episode again. Amadei Derros' powers and his connection to his amulet are barely touched upon except in so far as the episode needs a MacGuffin. Samantha's mother has no real motivations and just happens to fall in with a group of anti-alien bigots because of a bad break-up 20 years ago. The whole plotline with J'onn and Kara is just weak and poorly written overall. Still, if it sets up more Martian Manhunter detective stories, I can live with it. Still, it says a lot that the scenes with James - usually the weakest parts of any Supergirl episode - are actually the strongest this time around. Still, this episode needed a lot more rewriting before being filmed.